We have already seen quite a few leaked images and case renders of Samsung’s upcoming flagships. Now, a seemingly accurate Galaxy S10+ render has been leaked online. It doesn’t reveal anything new as far as the design of the flagship is concerned. 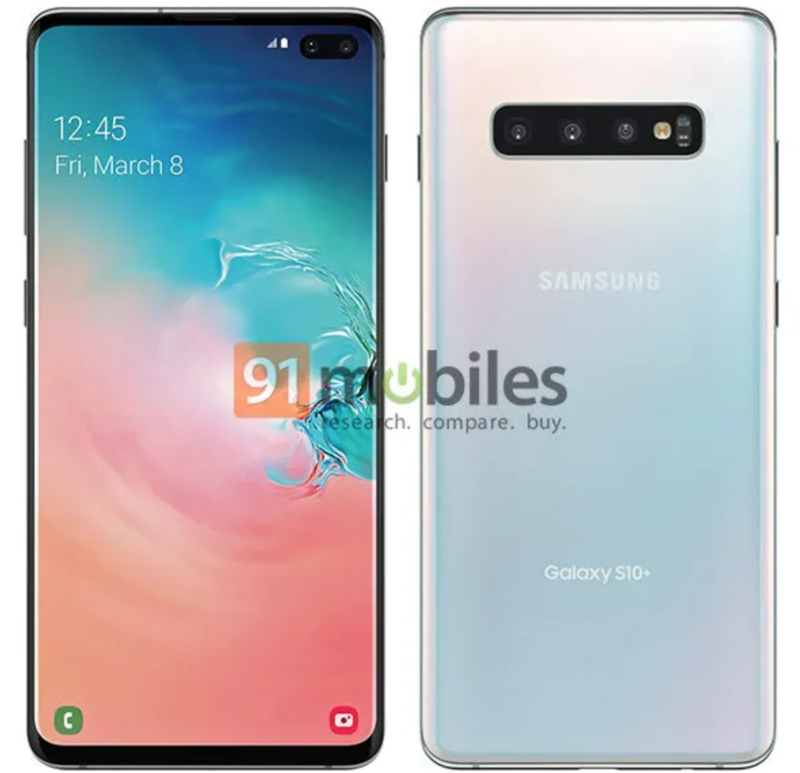 What we see in this render is in line with all of the rumors and reports so far about the Galaxy S10+. It will be the top-tier variant among the three that Samsung will be releasing as part of its new flagship lineup. It has been known for quite some time now that the Galaxy S10+ will have a dual front camera. We can see that in this render as well. There’s also a triple camera system at the back, as expected. The bezels aren’t as slim as some case renders have made them out to be. Even though promotional materials often tend to have unrealistically slim bezels, this appears to be a more realistic representation of the bezel situation on this handset. We already know what to expect from the Galaxy S10 series. This particular model will have a 6.4-inch display and the latest Samsung Exynos processor under the hood. It will also feature an in-display fingerprint sensor. There may also be a variant of the Galaxy S10+ with 1 terabyte of onboard storage. Samsung has already announced the memory chip which will allow for this eventuality. Expect more leaks concerning the Galaxy S10 series in the days to come. Samsung is going to officially unveil the device on February 20 in San Francisco. The lock screen in this render mentions March 8. That date has previously been rumored as the release day for the Galaxy S10. Whether or not that’s true will only be confirmed by Samsung on February 20. The bezels on the photo in this link are the same as here. I don’t think the chin is going to be a big deal, example Huawei P20 o Mate 20 they all have big chin a small top bezels and a ugly notch and the two of them are best-selling smartphones. The only one’s complaining are tech fans that are a tiny percentage of the smartphone pie. This hideous holes in the screen doesn’t justify the decrease in the bezel thickness… For me, it’s perfect and 100% tolerable the note 9/s9+ bezel, without these ugly holes. Samsung’s back copying apple and crapping their legacy. How exactly have they copied apple? their u said what’s on my mind. i agree! So they’re back to making crap, stepping-back and boring designs…well see you next year if I haven’t switched to iPhone or Xiaomi. Chin is required for the connector, if samsung folded the display inwards like the iphone, it would make the phone even more expensive. The only way that can happen is if every brand launches their phones at the same time. The Chinese have a significant time to do their camera settings after Samsung launches their flagship and exceed Samsung’s proposal.